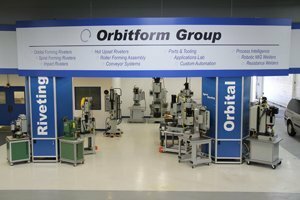 What happens when you take a simple orbital riveting machinery company, and staff it with the best of the best in the riveting, automation and assembly industries – you get ORBITFORM. In 1984, we took the mature product known as the orbital riveter, and not only made it better, but advanced its application in all industries. Dedicated to its Michigan roots, Orbitform equipment is 100% Made in the USA, in Jackson Michigan, and serves the bulk of the US automotive needs for riveting and forming, as well as many other industries including general industrial, medical, consumer, and more. “Spiral” form heads – a variation of the orbital pattern, preferred for certain applications. Let Orbitform help you decide what process is best for you! Rollerform Heads – REVOLUTIONARY! These heads are capable of rolling cylindrical parts in or out. We even offer an articulating roller head that can rollform or crimp the outside of a cylinder anywhere on the length of that cylinder. Milford and Adtech Impact Riveters – auto-feed and riveting of tubular, semi-tubular and sold rivets. Watchdawg Process Monitoring – add load cells, linear encoders and standard or custom, application specific software to monitor your process and increase your quality yield and prevent failures. Hot Upset – a variation of impact/straight press technology combined with resistance welding – used for forming extremely hard materials and complete shank swell and fill on complicated, heavy duty joints. Custom automation and tooling – whatever your need, if it involve our core competencies, we want to help. Our free lab service is available to you. We can help suggest design changes and verify that our process can reliably deliver the results you need.